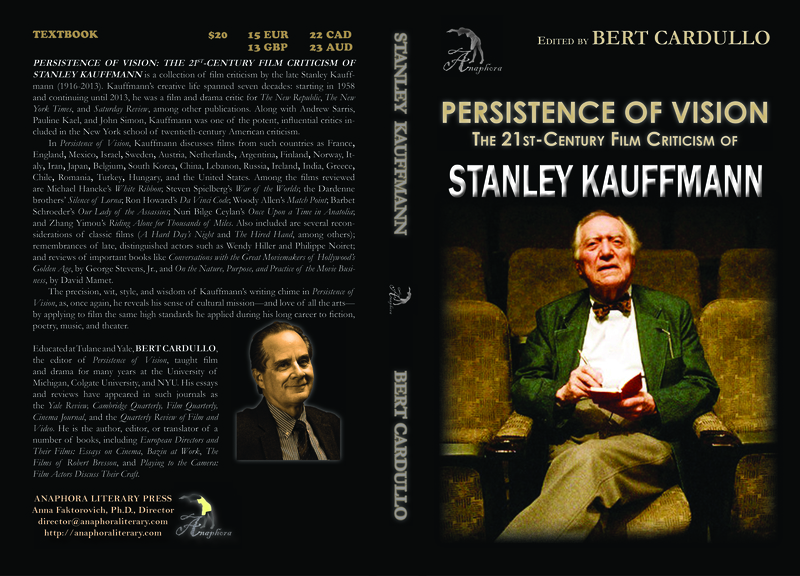 Persistence of Vision: The 21st-Century Film Criticism of Stanley Kauffmann: ($20, 302pp, 6X9″, ISBN: 978-1-68114-007-0, LCCN: 2015930072, January 2015; Out of Print): is a collection of film criticism by the late Stanley Kauffmann (1916-2013). Kauffmann’s creative life spanned seven decades: starting in 1958 and continuing until 2013, he was a film and drama critic for The New Republic, The New York Times, and Saturday Review, among other publications. Along with Andrew Sarris, Pauline Kael, and John Simon, Kauffmann was one of the potent, influential critics included in the New York school of twentieth-century American criticism. In Persistence of Vision, Kauffmann discusses films from such countries as France, England, Mexico, Israel, Sweden, Austria, Netherlands, Argentina, Finland, Norway, Italy, Iran, Japan, Belgium, South Korea, China, Lebanon, Russia, Ireland, India, Greece, Chile, Romania, Turkey, Hungary, and the United States. Among the films reviewed are Michael Haneke’s White Ribbon; Steven Spielberg’s War of the Worlds; the Dardenne brothers’ Silence of Lorna; Ron Howard’s Da Vinci Code; Woody Allen’s Match Point; Barbet Schroeder’s Our Lady of the Assassins; Nuri Bilge Ceylan’s Once Upon a Time in Anatolia; and Zhang Yimou’s Riding Alone for Thousands of Miles. Also included are several reconsiderations of classic films (A Hard Day’s Night and The Hired Hand, among others); remembrances of late, distinguished actors such as Wendy Hiller and Philippe Noiret; and reviews of important books like Conversations with the Great Moviemakers of Hollywood’s Golden Age, by George Stevens, Jr., and On the Nature, Purpose, and Practice of the Movie Business, by David Mamet. The precision, wit, style, and wisdom of Kauffmann’s writing chime in Persistence of Vision, as, once again, he reveals his sense of cultural mission—and love of all the arts—by applying to film the same high standards he applied during his long career to fiction, poetry, music, and theater. 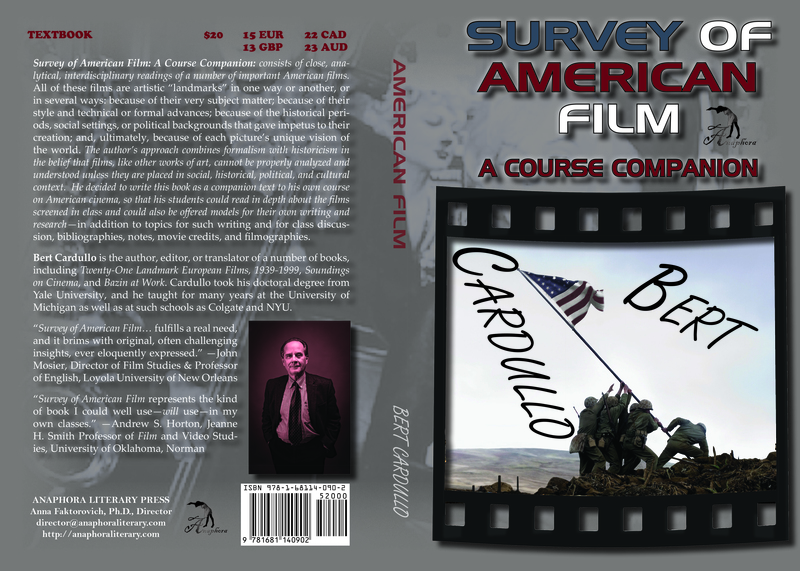 Survey of American Film: A Course Companion: ($20, 300pp, 6X9″, LCCN: 2015904376, Print ISBN-13: 978-1-681140-89-6, ISBN-10: 1-68114-089-6, EBook ISBN-13: 978-1-681140-90-2, LCCN: 2015904376, April 2015; Out of Print): consists of close, analytical, interdisciplinary readings of a number of important American films. All of these films are artistic “landmarks” in one way or another, or in several ways: because of their very subject matter; because of their style and technical or formal advances; because of the historical periods, social settings, or political backgrounds that gave impetus to their creation; and, ultimately, because of each picture’s unique vision of the world. The author’s approach combines formalism with historicism in the belief that films, like other works of art, cannot be properly analyzed and understood unless they are placed in social, historical, political, and cultural context. He decided to write this book as a companion text to his own course on American cinema, so that his students could read in depth about the films screened in class and could also be offered models for their own writing and research—in addition to topics for such writing and for class discussion, bibliographies, notes, movie credits, and filmographies. Educated at Tulane and Yale, Bert Cardullo, the editor of Persistence of Vision, taught film and drama for many years at the University of Michigan, Colgate University, and New York University. His essays and reviews have appeared in such journals as the Yale Review, Cambridge Quarterly, Film Quarterly, Cinema Journal, and the Quarterly Review of Film and Video. He is the author, editor, or translator of a number of books, including European Directors and Their Films: Essays on Cinema, Bazin at Work, The Films of Robert Bresson, and Playing to the Camera: Film Actors Discuss Their Craft.